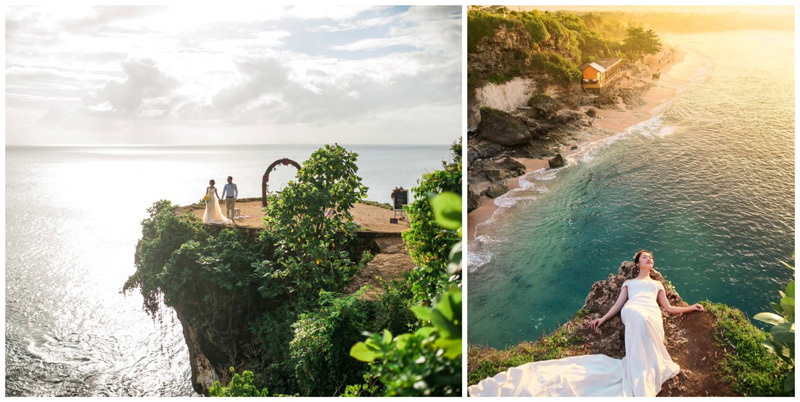 Does your dream wedding consist of sandy beaches, lush jungles, hidden caves, dramatic clifftops and everything in between? 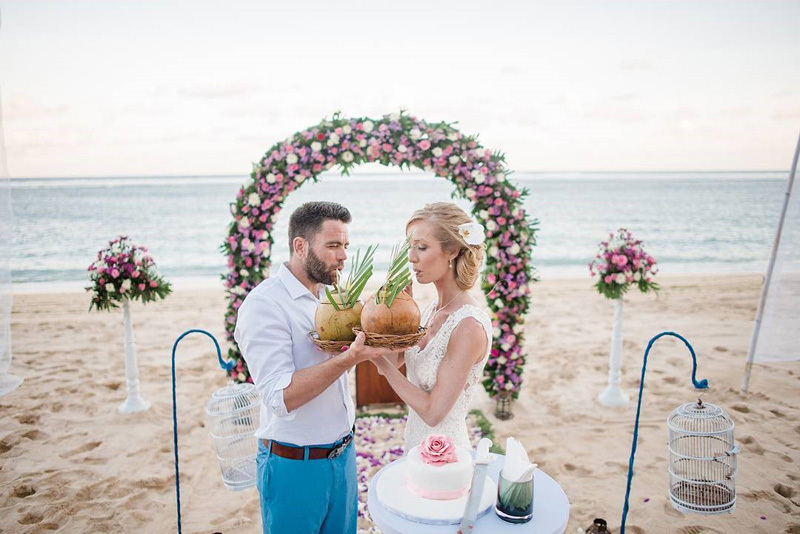 While each city provides ample options in the form of luxurious hotels for wedding ceremonies, the charm of a travel-destination wedding like on the tropical island of Bali is still unchallenged. No but seriously, we’ve heard of unusual wedding venues like getting married right in Taco Bell in Las Vegas (yep! If you don’t believe it, just Google it!) but when you’re in Bali my friend, things take an even hotter turn (so hot that you might only need a bikini!). While you might be busy with your guest list, count me in! I’M READY (and also not invited, I guess); we’re offering you some help with the wedding venue! 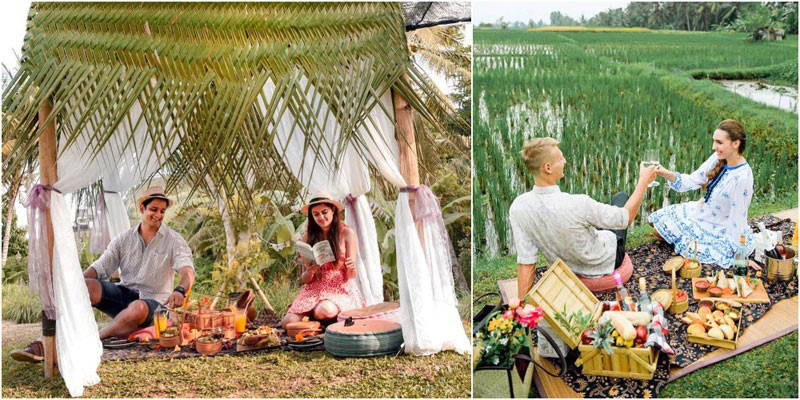 22 Fairytale pre-wedding photoshoot locations in Bali that are perfect for romantic memories! 9 Dreamy beachfront wedding villas in Bali with private pool and at least 5 bedrooms for your wedding getaway! We know you are forever debating whether you should hire an expert to help execute your wedding, but heck, there is no doubt that hiring a pro can take a huge weight off your shoulders, so you can truly enjoy being the bride and groom – the stars of the day – instead of stressing out over logistics on your wedding day itself (trust us, some of us have been through it and it was a nightmare!). You’ll want to say “I do” to a wedding-party pro like The Seven Agency – trusted by over 2,000 couples around the world! Their unbeatable crew does a lot more than just picking out pretty flowers or tabletop décor. 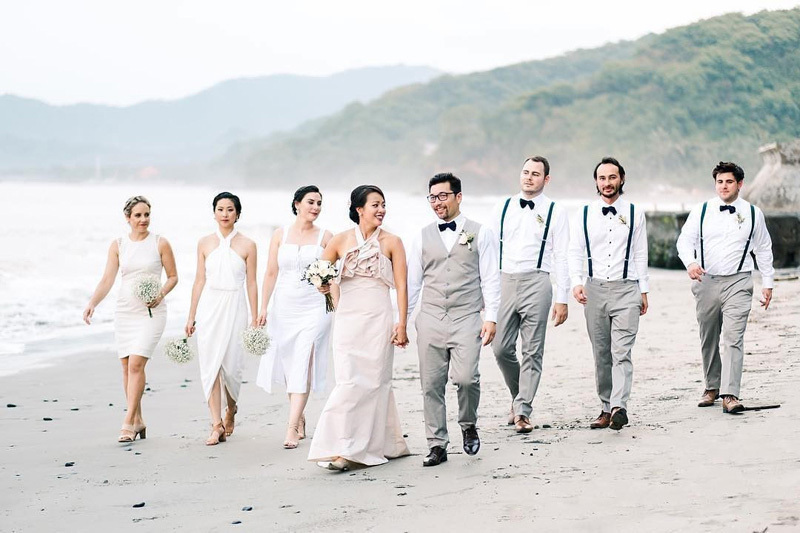 The Seven Agency essentially juggles the roles of designer, legal counsel, budget manager, coordinator and therapist — all while helping you pull together your wedding in tropical Bali. They will take care of everything on your to-do list, from choosing aesthetic details to going through vendor contracts, dealing with emergencies as well as your biggest, wildest wedding dreams! Every couple has different needs, and this agency knows how to cater to all of it, to help you throw a wedding of a lifetime. So you’ll be in good hands regardless of whether you’re troubled over unmatching bouquets or overbearing in-laws! 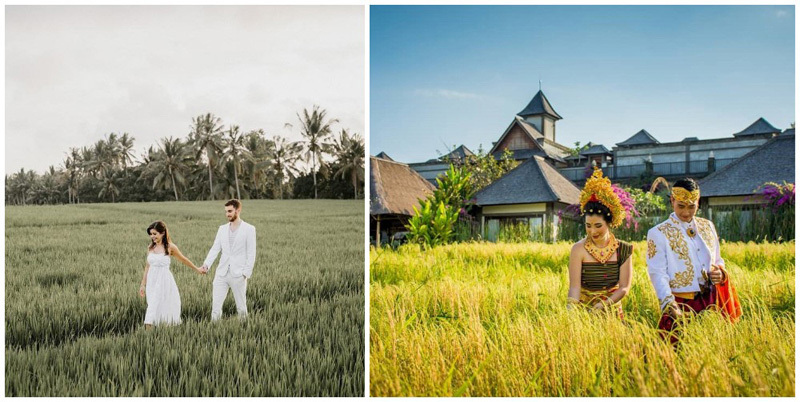 Keen to win a pre-wedding photoshoot in Bali by The Seven Agency? We are running a contest from 22 February to 1 March 2019! Join here! Your wedding can’t get more impressive and dramatic when it’s held at the top of a cliff overlooking spectacular views of the Indian Ocean. After all, it’s the stuff movies are made of! 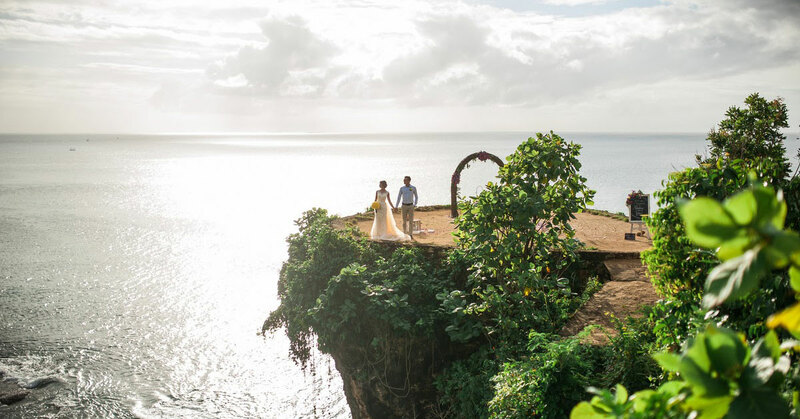 Blame it on its collection of absolutely amazing oceanfront cliffs – Bali wins it at taking your wedding to another level (literally). 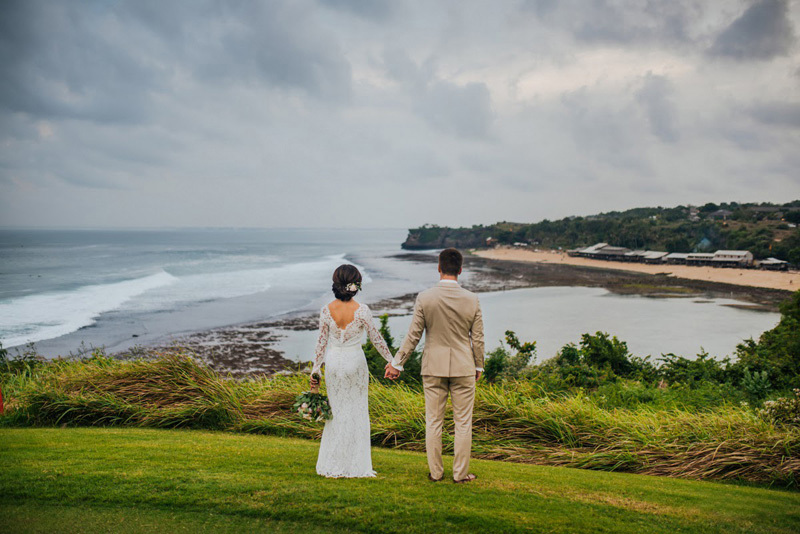 Known as one of the most popular wedding venues and an almost-iconic sunset spot in Bali, Balangan offers a landscape with the perfect combination of white-sand beach and picturesque cliff. 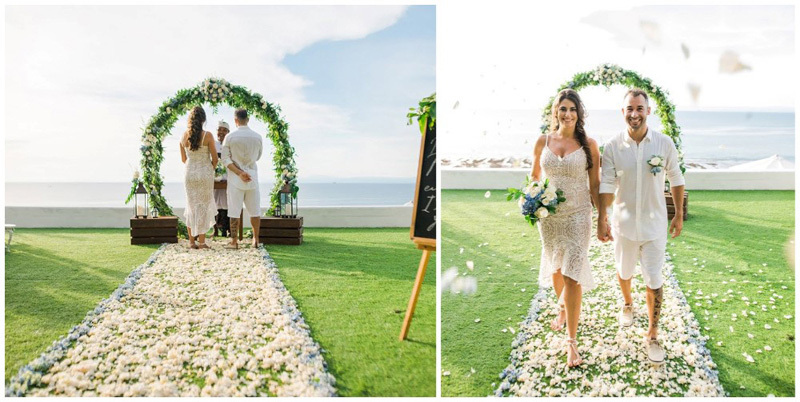 Close your eyes and picture this: Warm salty ocean air flowing through the venue, fluttering the floral display, lace and chiffon train of your gown, accompanied by soft, romantic music playing in the background with the sounds of the crashing waves. 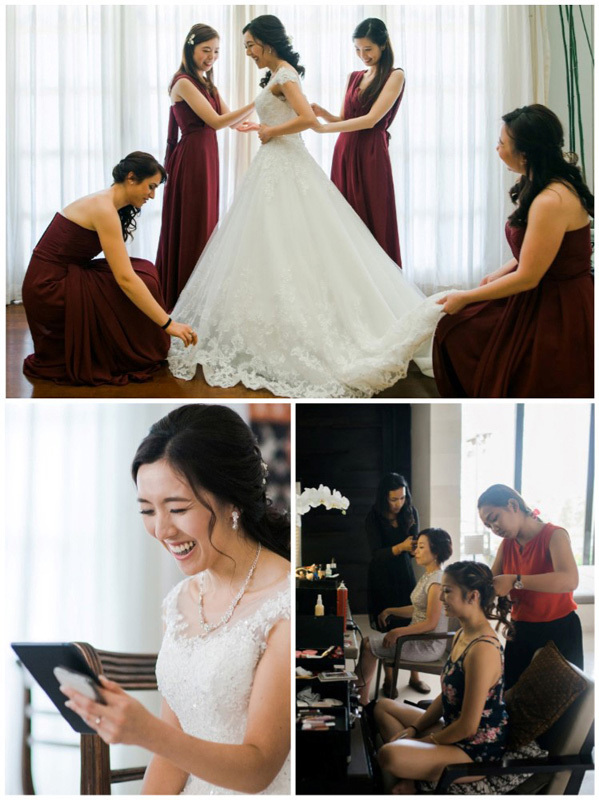 Now imagine all of your dearests gathered together and waiting for you to walk down the aisle in your gorgeous dress. Then picture yourself standing at the altar with your groom, with the rocky terrain below and the breathtaking sight of the ocean and horizon from afar. Ahhhh… besides all other emotions you could be feeling at that particular moment, you sure will take some time to realise that this is a feast for the senses! Sounds sublime, isn’t it? But is it realistic? Definitely yes, and it is easier to achieve than you think, especially with an expert wedding planner! 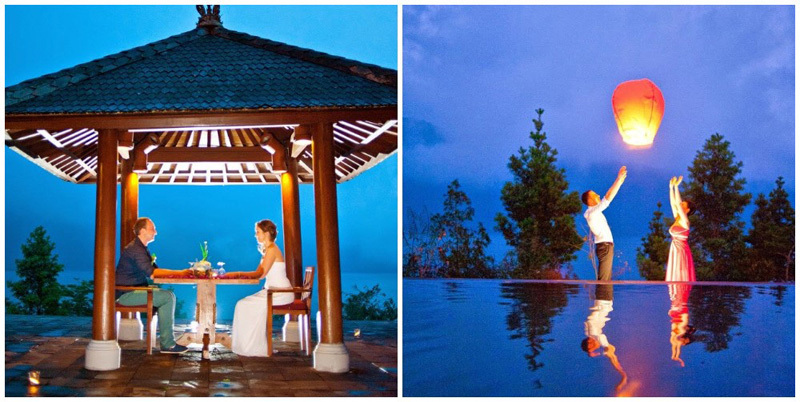 Get married in Bali with ease with the help of a trustworthy wedding planner! 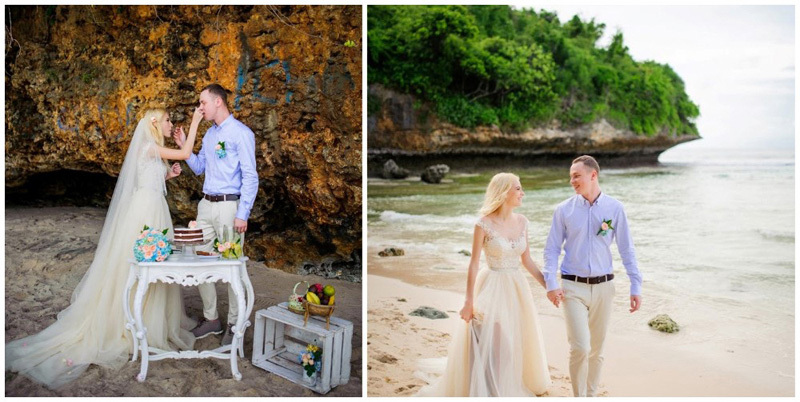 Tie the knot right on Bali's dramatic beaches! 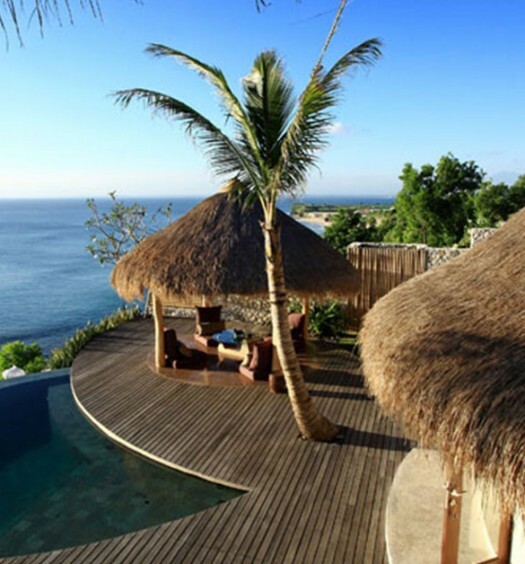 Dreaming of a honeymoon in Bali? Let the experts customize yours! 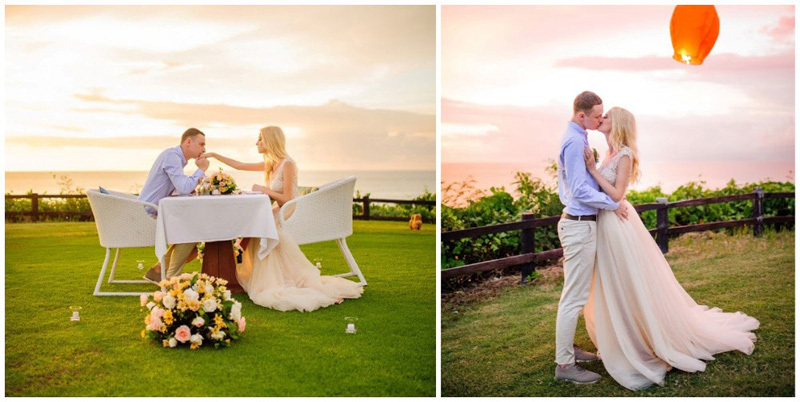 Read our Bali brides' personal reviews here! What’s either romantic, mysterious, or filled with buried treasure? 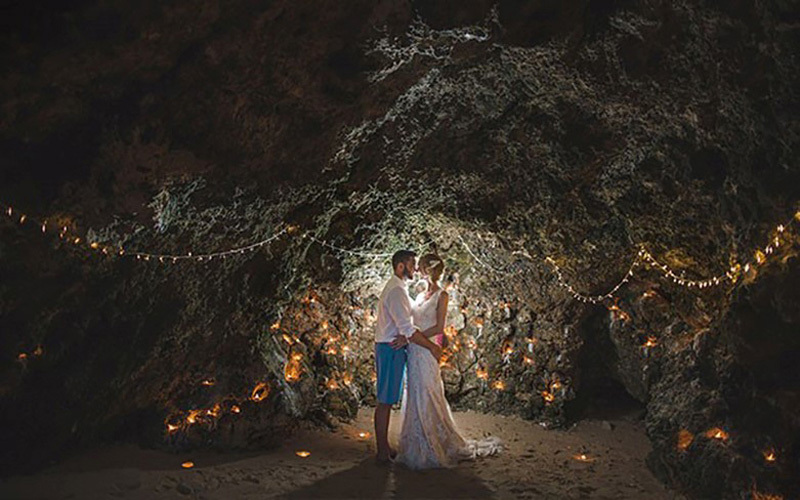 With a jagged-rock backdrop, a cave will create the most spectacular setting for your wedding! Of course, we are not talking about just any cave where you have to rappel into, but instead, an easy-to-maneuver cave where you can enjoy a unique experience after being joined in marriage with toes in the sand. With its raw natural rocky beauty and endless views of the ocean, the cave at Samabe Bali Suites & Villas is the magical grotto of your dreams. 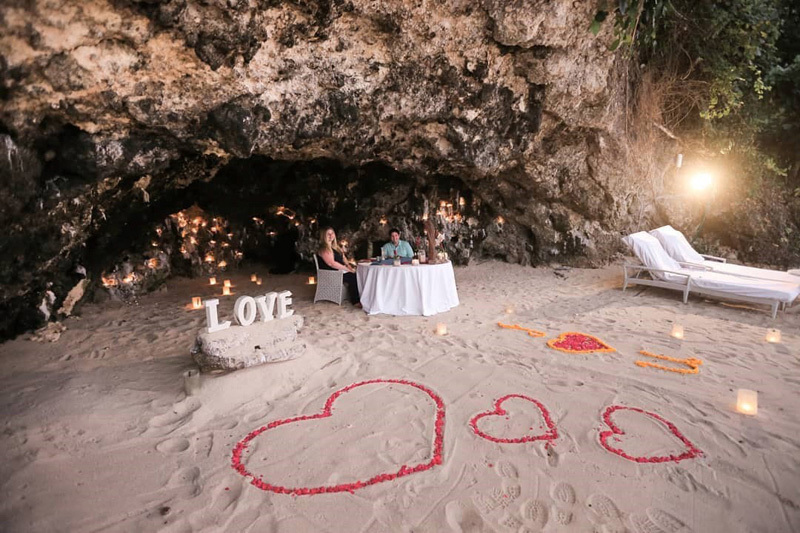 Walk down to an untouched white-sand beach to exchange your vows before enjoying a romantic dinner in the candle-lit cave. This natural cavernous escape comes with splendid views of the sea. You never know where a bit of a wanderlust will take you. 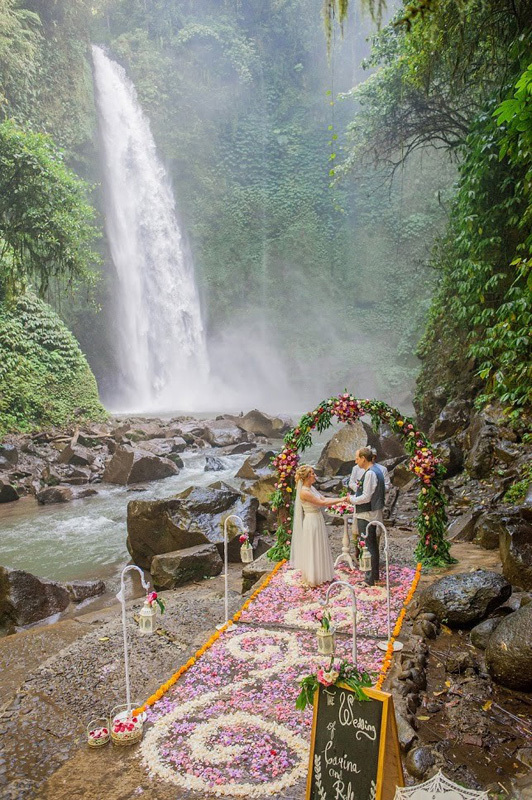 Located high in the mountains of Bali, Nung Nung Waterfall is rated as one of the best around the island, and a day exploring might bring you face-to face-with the unique wedding venue of your dreams. Trouble is, it wasn’t actually a wedding venue at all but just a majestic tourist attraction. However, with the right wedding planner, even your wildest wedding wishes can turn into reality! 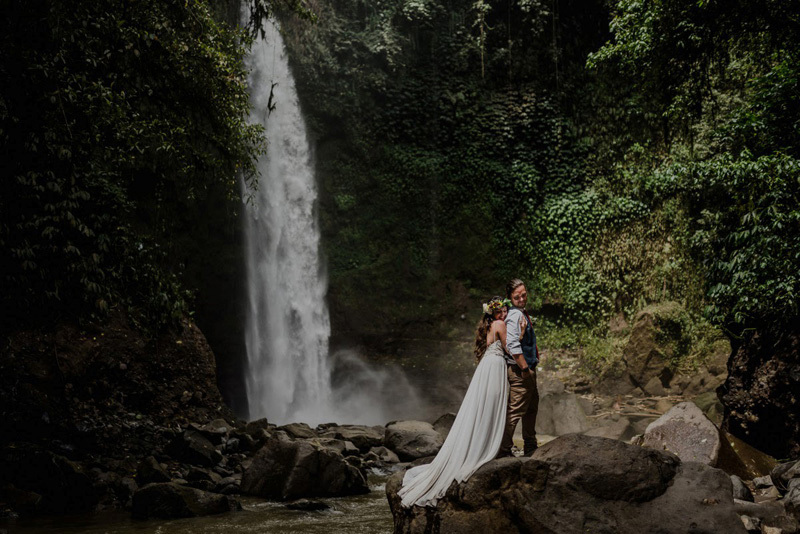 With absolutely no need for props, you get to enjoy a tumbling waterfall that provides a frothy, lacy white backdrop blending beautifully with the bride’s wedding gown. 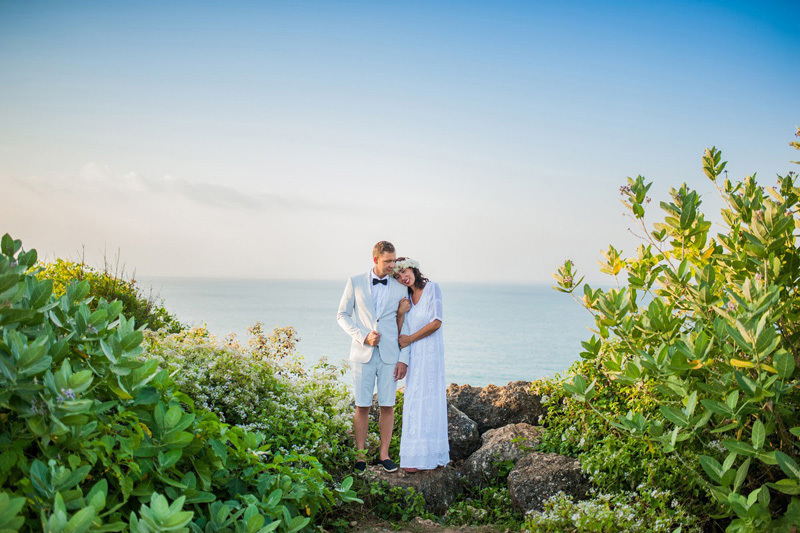 The location, setting and atmosphere make it perfect for a boho-chic wedding, perfect for the tropical yogis of Bali, adventurers at heart and for soul searchers – be surrounded by nature while you say your vows. You don’t even need a sound system when you get to exchange vows to the sights and sounds of rippling water, chirping birds, and the jungle! 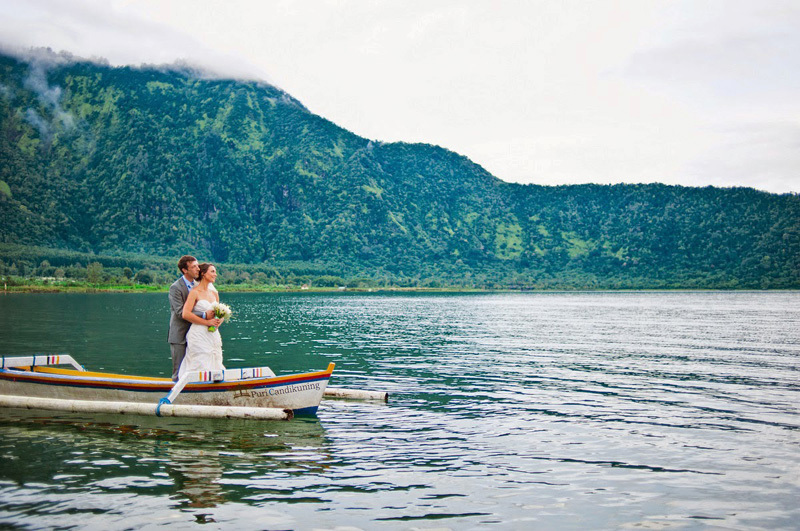 Hop onto a canoe to say “I do” in the middle of a lake! 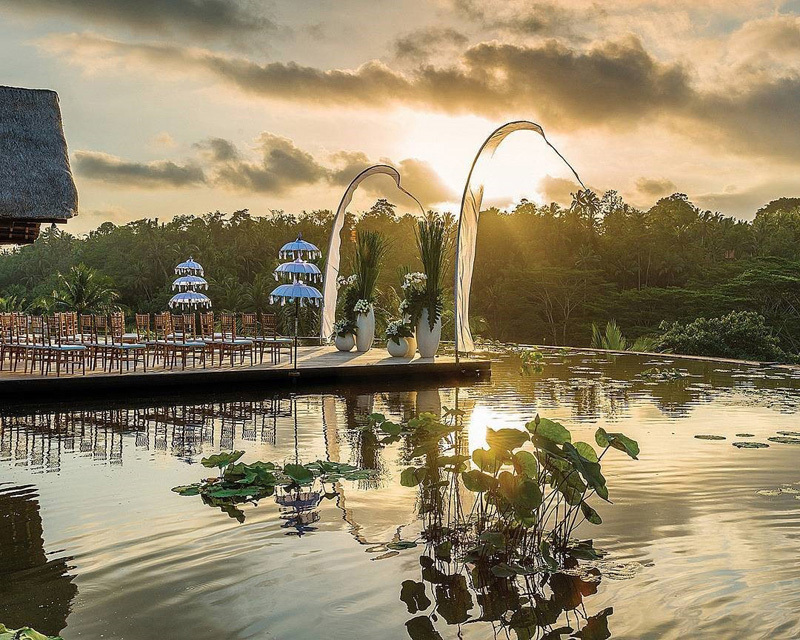 You can create your distinctive, elegant and exclusive lakeside wedding at Puri Candikuning Resort as it sits right next to Beratan Lake. We know that lakes are often overlooked in favour of the beach when it comes to wedding venues, but if you are looking for an unconventional ceremony on your very special day, you will love this winter wonderland. Located high in the mountains, with crystal clear water, exotic lush green gardens, this volcanic lake blesses you with a pleasant temperature of 23°C (trust me, the last thing you want is to turn up to your wedding ceremony all sweaty with makeup dripping down your pretty face!). 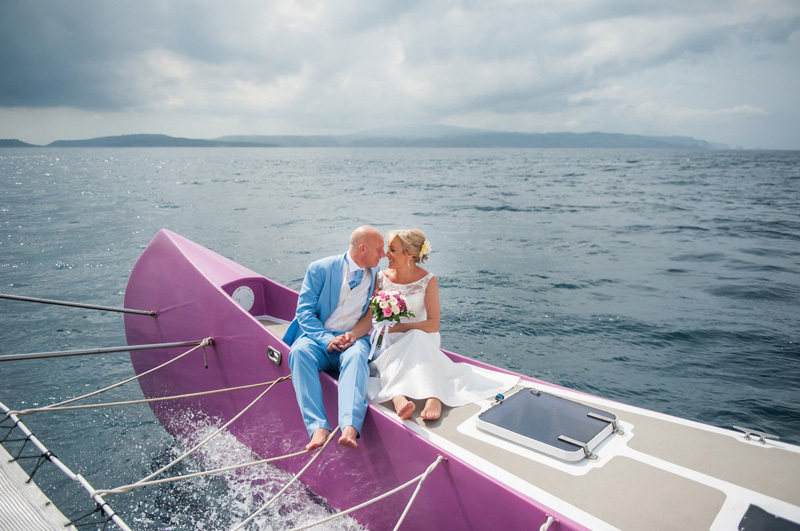 After the wedding, you will be escorted to a luxury villa with panoramic views of the mountains and the lake, where you will spend your unforgettable wedding night as you get to wake up to some of the most phenomenal views on the island. What a romantic start to your life together! Just in case you didn’t get it yet, this sensational lakeside wedding venue is for those who (just like us) can’t spend a day without the sights of nature and enjoy the sound of silence. It is an ideal location for those wishing to keep it simple and intimate (hello there introverts, we feel you!). 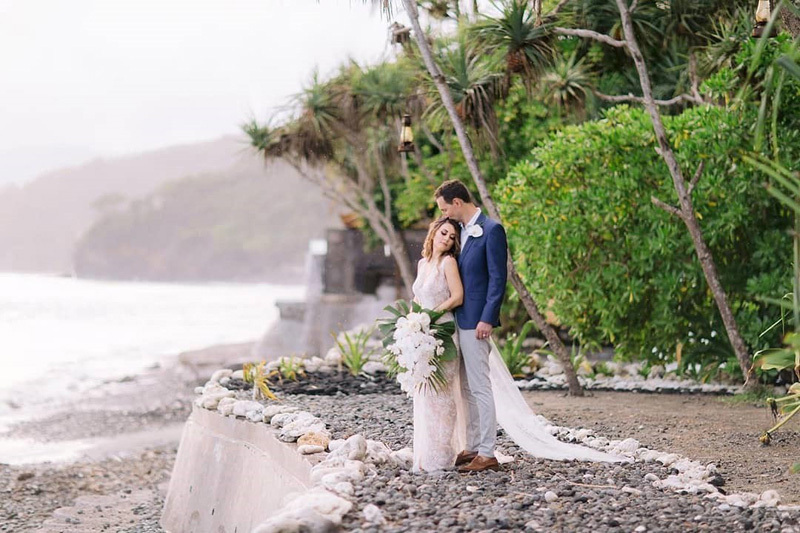 Bali sure provides brides and grooms the options of getting married on a white-sand beach or in the mountains, but your guests will never expect to see you tie the knot in an unforgettable oceanfront villa with Santorini vibes. 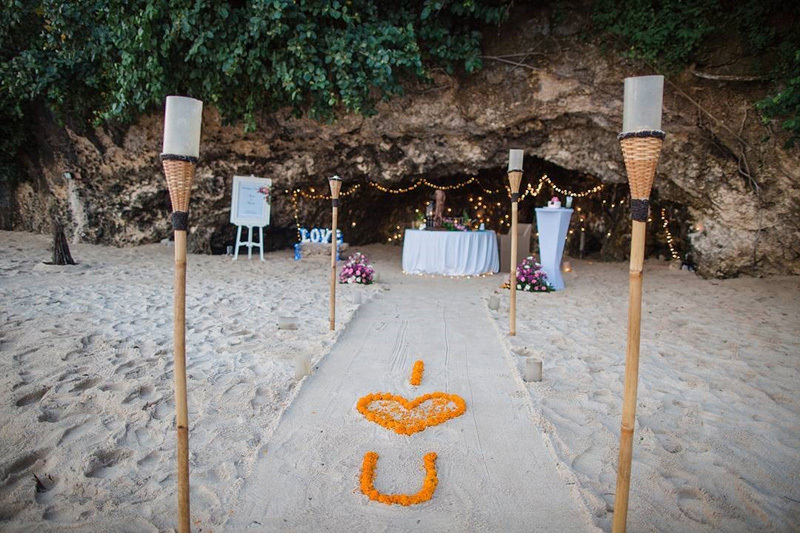 You’ll find Morabito Art Cliff on the coast of Uluwatu (South Bali) and this vows-perfect venue doesn’t disappoint! It’s literally as though you paid an affordable flight to beautiful Bali and got transported to an even more spectacular Cycladic island set in an ancient caldera! 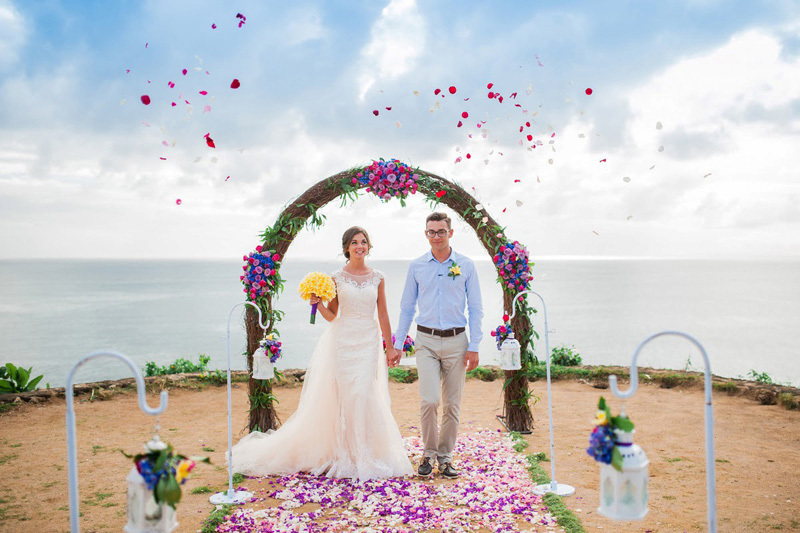 Say “I do” on their rooftop ‘Temple Terrace’ while surrounded by the crystal turquoise waters of the Indian Ocean, boasting rugged landscapes and sandy beaches. 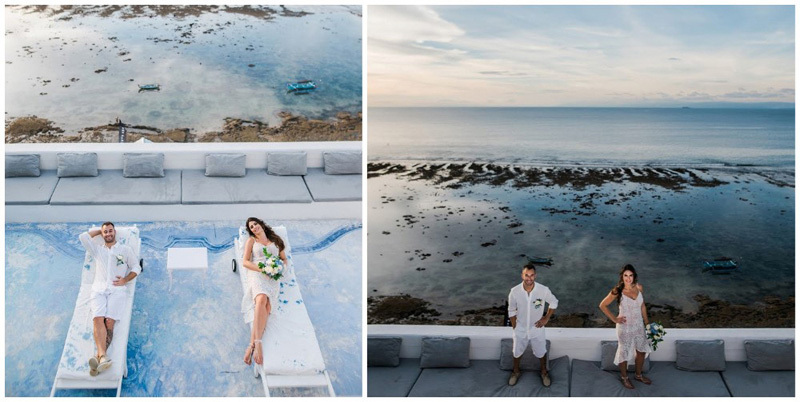 And since they know you are not ready to let go of the scenery, there are also two nights at the Santorini Terrace Penthouse with jacuzzi offered as part of your wedding package! The loft guarantees postcard-perfect views and magazine-approved decor. After all, the architecture and interiors can’t really go wrong when designed by Paris-based French jeweller Pascal Morabito! 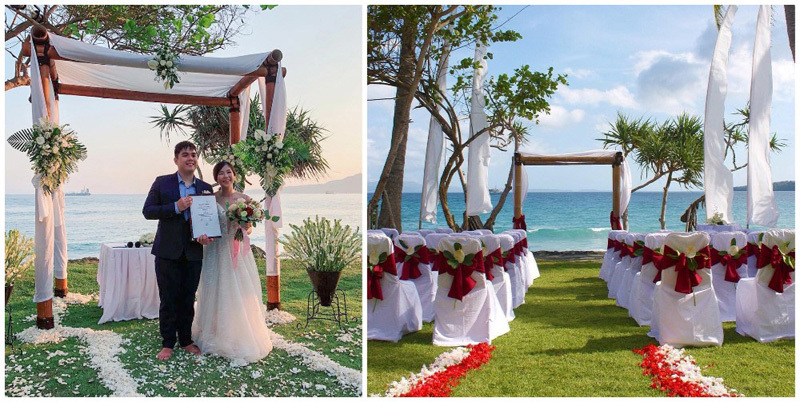 It is almost guaranteed that when you hear “Wedding in Bali”, a beach wedding might immediately come to mind! 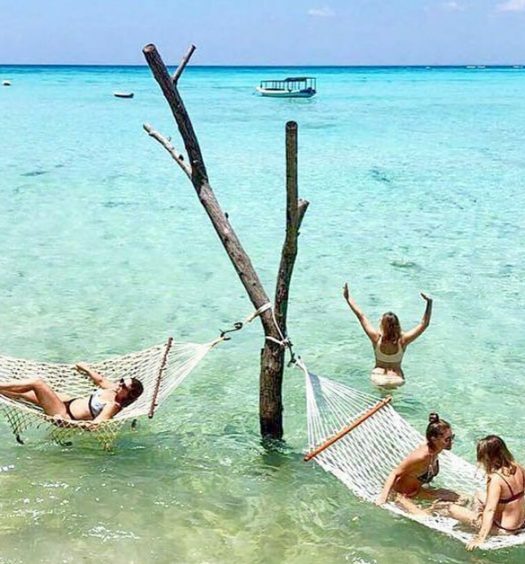 Yes indeed, Bali has that on offer and no one (including celebrities) can possibly resist the lure of a powdery white beach, turquoise ocean, sunny sky, and relaxed island vibe; these are exclusive features that might be hard to beat. 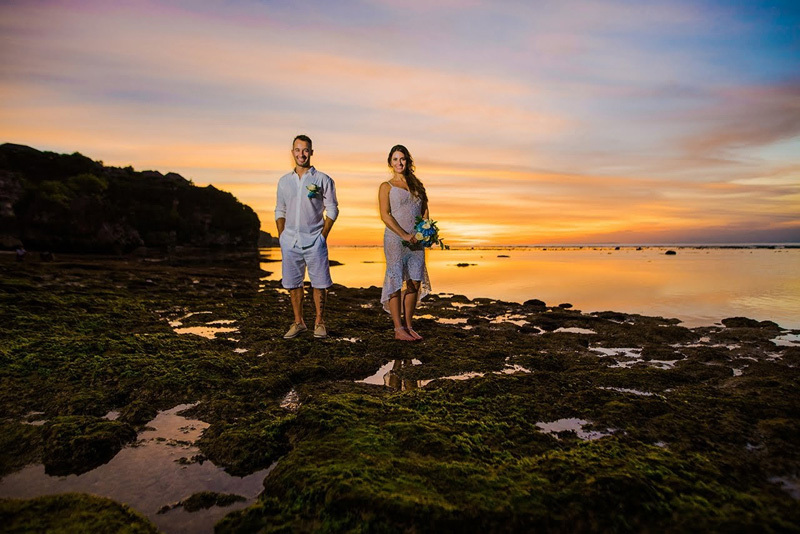 However, it can be quite a challenge to narrow down exactly where to hold your beach wedding as beaches in Bali can be packed to the brim with regular beach bums on the lookout for tan lines and hot surfers. 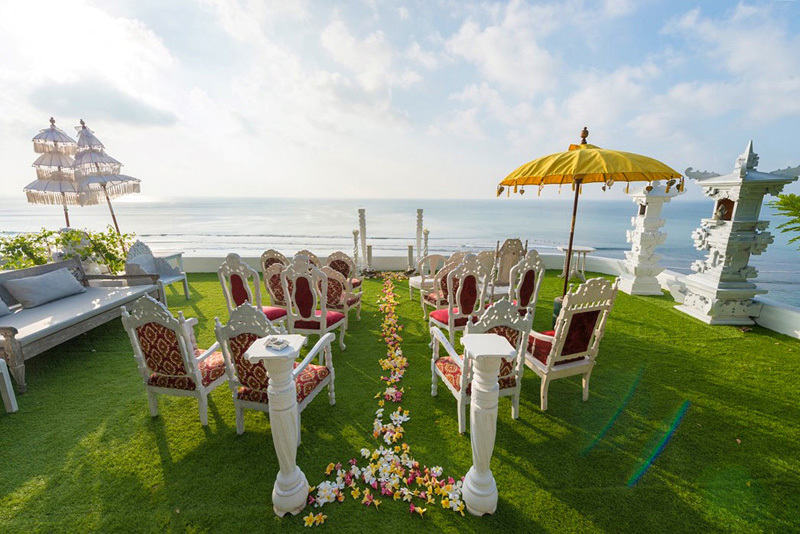 But off the grounds of the New Kuta Golf Course lies a hidden stretch of sand and this is exactly where you’ll get to exchange your vows in your beach style wedding dress, your flat wedding shoes and in all privacy! 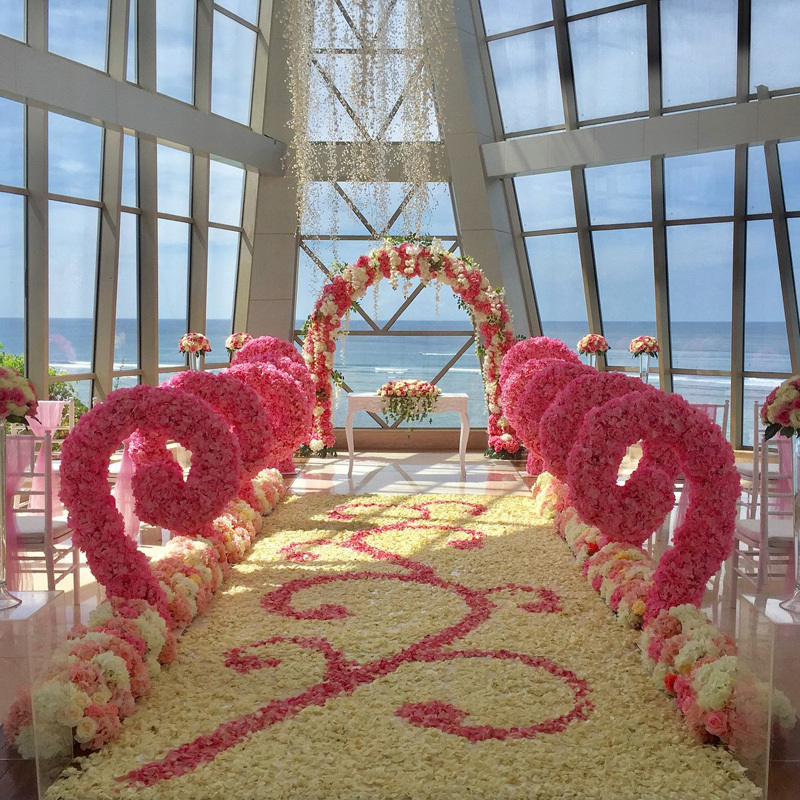 With the soothing sounds of the crashing waves in the background, this location is only calling for you to say “I do”. So, if this is tempting to you, you might want to bring it a notch higher and celebrate in style with their post-ceremony dinner on a private cliff; yet another dream spot! Doesn’t ‘I do’ always sound better with toes in the sand and salt love in the air? 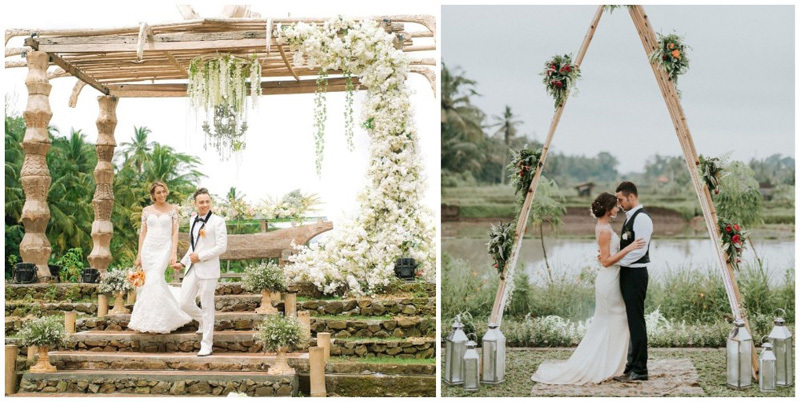 There’s nowhere more alluring or exotic than to wed at this romantic retreat flanked by tropical gardens, jungles, forests and right beside the magnificent Ayung River bank in magical Ubud. 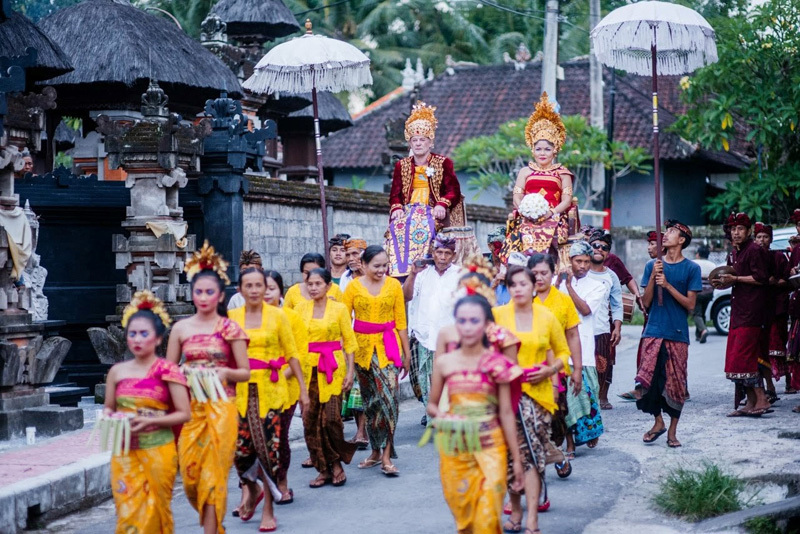 Dreaming of a traditional Balinese wedding? Or a contemporary ceremony? Or do you still have no clue? 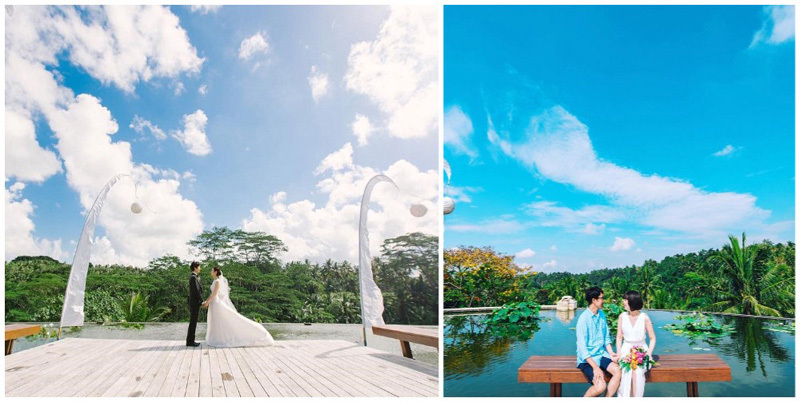 Whether it’s a lavish affair with all your friends and relatives or an intimate ceremony for two, your special big day will be effortlessly planned to perfection at Four Seasons Resort Bali Sayan. 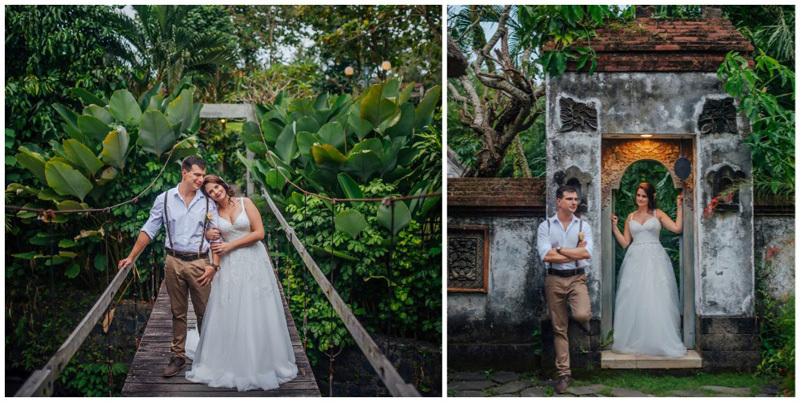 What is a wedding in Bali if it doesn’t comprise of green rice paddies and lush jungle views? Probably not very Balinese! 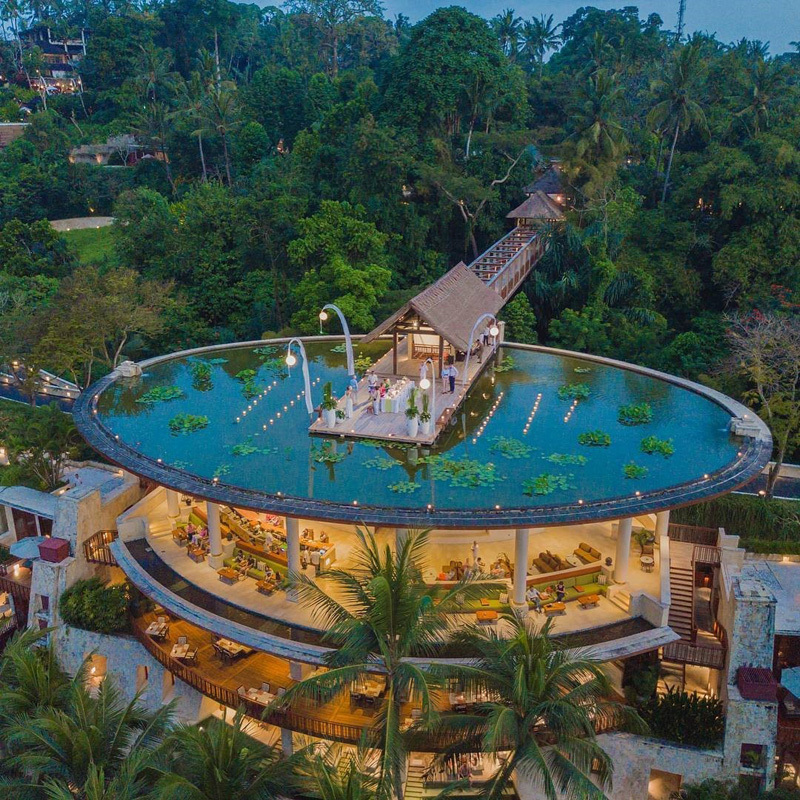 At Four Seasons Resort Bali Sayan, you lovebirds get to exchange your special vows on the terrace of Rooftop Lotus Pond, surrounded by blooming lily pads and lotus flowers, making it the perfect pick for a wedding straight out of a movie scene. 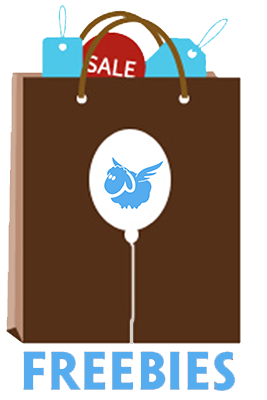 Note: This package is currently not listed on The Seven Agency’s website, but is available upon request with the agency. 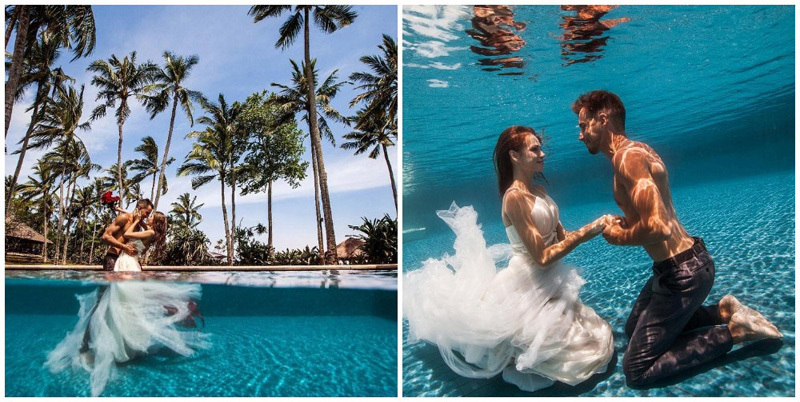 For mermaids who want to wear bikinis on their wedding day, rejoice as this is very well possible in Bali! Picture this: Instead of walking down an aisle, you and your partner take the plunge and tie the knot right in the ocean. And to tie the knot in this spectacular style, you don’t even have to be a certified diver as you will be entitled to short diving courses as part of your wedding package. On your wedding day, you get to dip deep into the ocean off Bali’s east coast, which is known for its great dive sites and very clear waters. You will also be able to induce some serious jealousy among your friends as the package includes a four-hour underwater photoshoot right at the property’s pool for some killer pictures! What’s better, the hotel has seven great dive sites close to its grounds, so you might want to come back for your honeymoon if your wedding in the deep has inspired you to take greater depths! Package Inclusions: Two nights’ stay with lunch, romantic dinner, 90-minute spa session, underwater pre-wedding photoshoot, dive introduction, diving insurance, bridal bouquet, underwater garden and more. Beach person that I am, I feel like there is something even dreamier about having an authentic Balinese wedding in the rice paddies. I mean, the pictures speak for themselves. Now I want to get married! 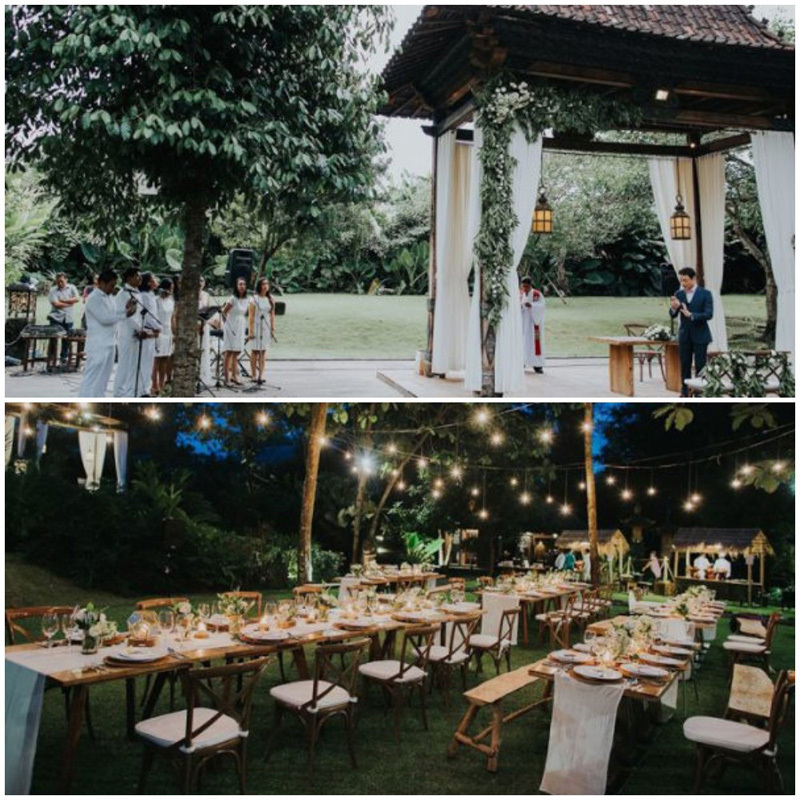 The fact that the venue is situated in Ubud, the quieter and “zen” part of Bali, further adds to the authenticity of any special event. At Desa Visesa Ubud, you can get the whole shebang, seas of green and the most serene moments. 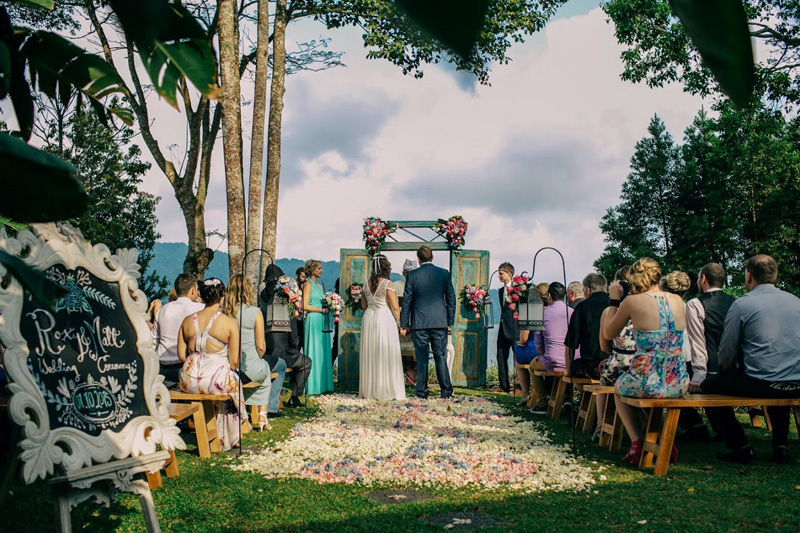 And though we’ve seen many unique wedding venues around Bali, it seems that none closely resembles the true authentic Balinese experience of saying “I do” in a place where nature takes the centre stage. Being culturally inspired and honouring past traditions, you will be thrilled to see how the location maintains its architecture with much respect paid to the indigenous culture of Bali. 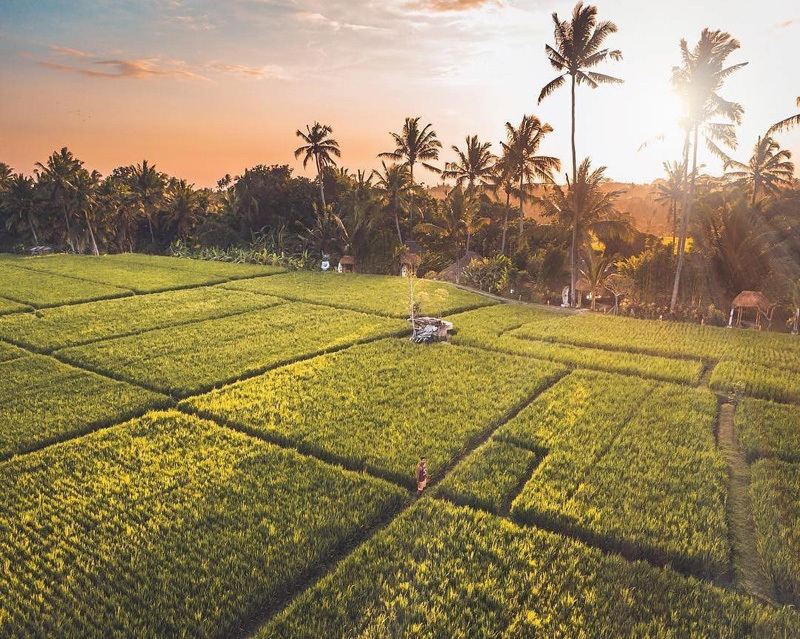 Besides the grandeur of the rice paddy fields that might steal the show, your guests are sure to return home with memories of the essence of a traditional Balinese village and having satisfied their curiosity about daily life on the island. Gone are the days of perfect white wedding gowns, cakes, well-thought-out decor, limousines, and guests in great outfits. 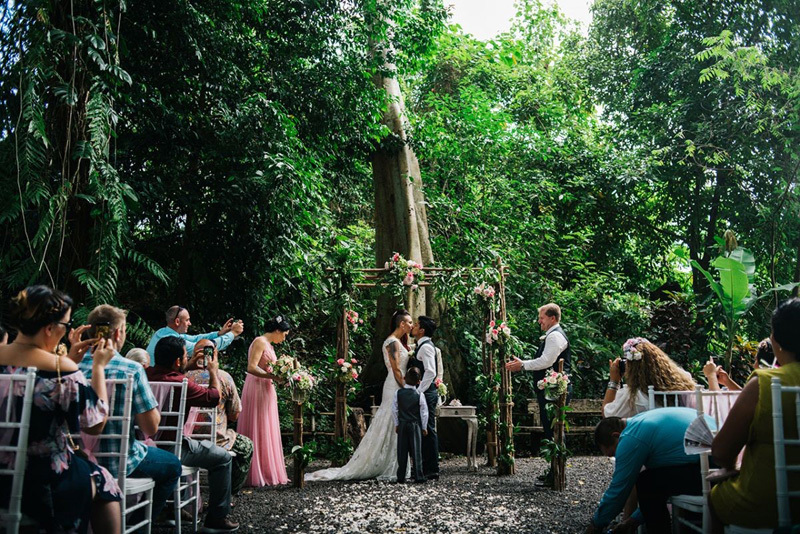 You can now have your fairytale wedding in a Tinker Bell ambience right in the middle of the jungle – one that could transport you and your guests to an unforgettable, magical world amidst nature! If you are on the fence about having an outdoor ceremony, build your unique fascinating tale and let the lion in him get married to the beautiful lioness in you. It’s about to get wild! 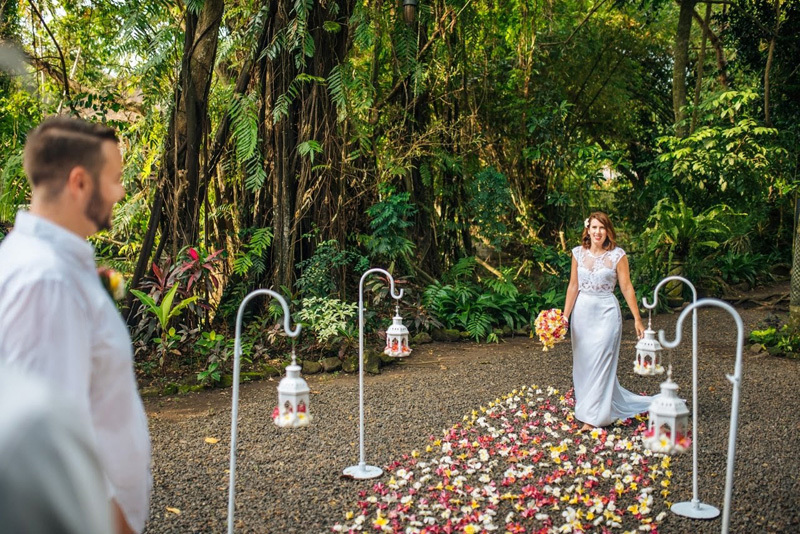 We know it can be hard to picture a perfect Tarzan-and-Jane scene without mosquitoes, muddy paths and humid weathers, but rest assured that your tropical jungle wedding here doesn’t totally mean you’ll have to rough it out; you sure will have your pick of gorgeous scenery and much more. Ready to switch from the traditional indoor ceremony to a whimsical woodland wedding? This location sure has the scenic backdrop thing covered! Is your love as endless as the grand horizon? Do you fancy the Indian Ocean as your ultimate wedding backdrop? 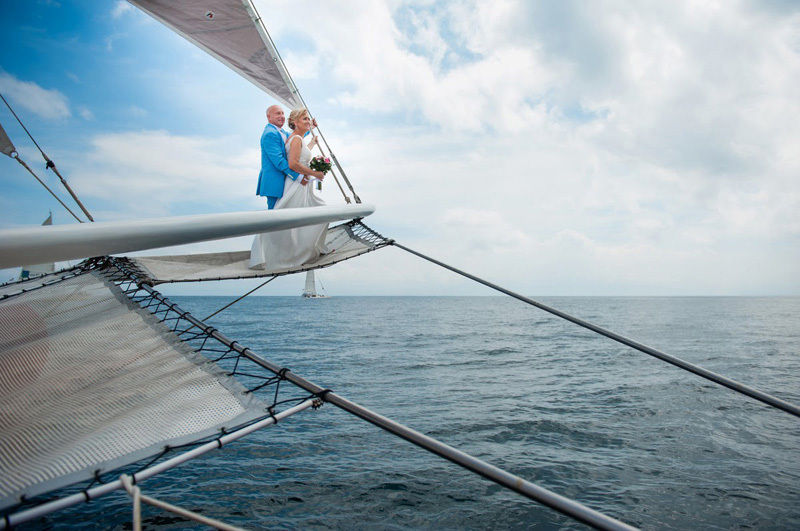 Come on board for a nautical wedding of a lifetime! 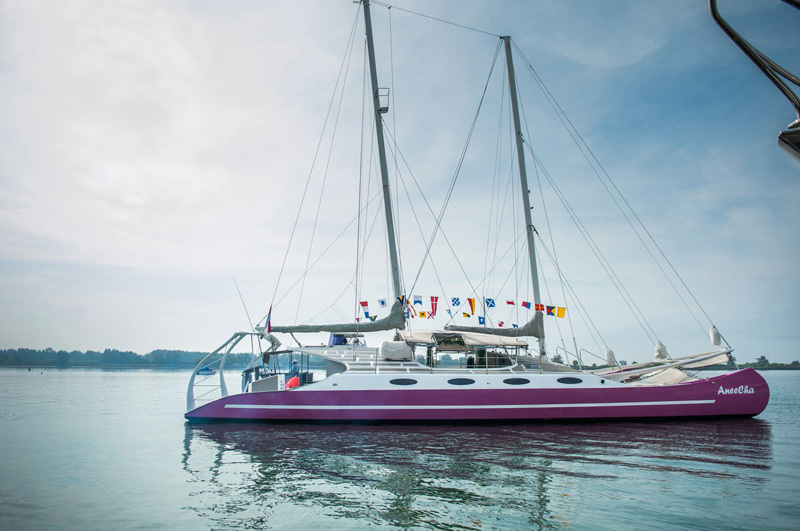 While you can choose to either hold your ceremony on board the yacht or on a nearby beach, this unique mobile venue will take you from Bali mainland to Nusa Lembongan (and back) to celebrate in style! 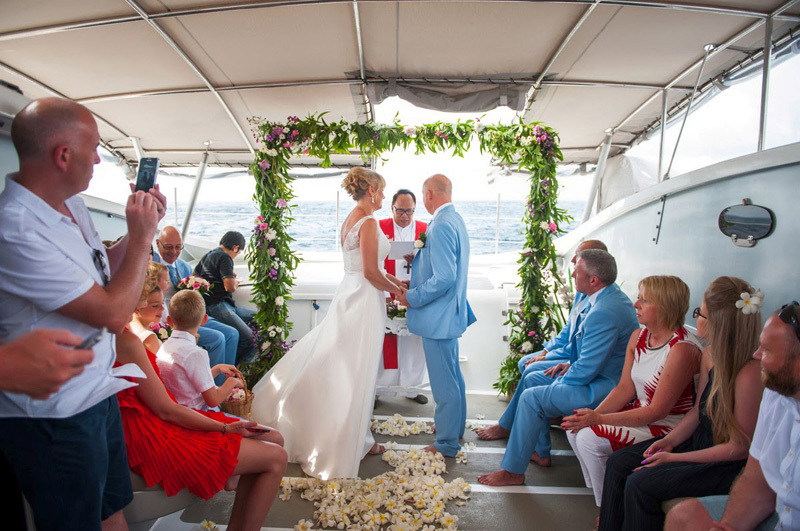 Every wedding ceremony is concluded with a cruise to the nearby exotic islands, where you and your guests get to snorkel in a spectacular underwater world. For the perfect celebration ending, you also get to enjoy a romantic dinner as you watch the sun set below the horizon on the way back to Bali. While this sounds a lot like the most lavish weddings in history, you can choose to make it intimate too, but seriously who doesn’t party to a loud “ ♫ Ceeelebrate good times, come on! ♫” on their wedding day when its held right in the middle of the sea and sure to bother no one!? 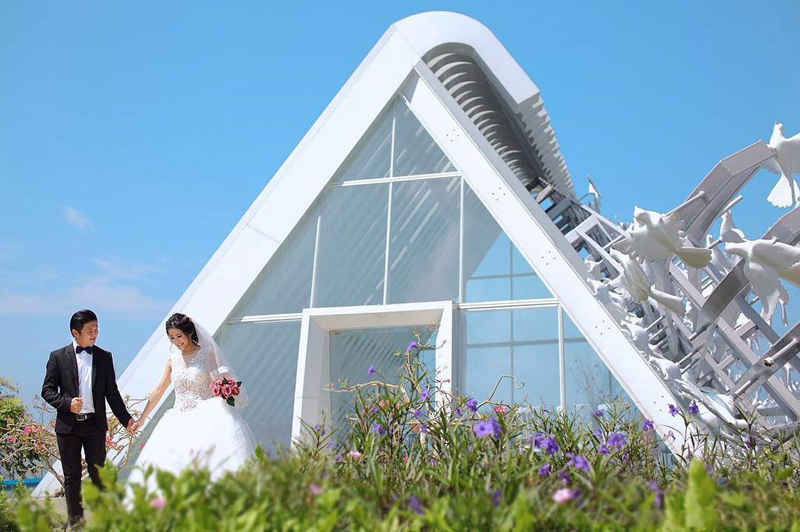 Imagine saying “I do” in a whitewashed full transparent glass chapel that overlooks a breathtaking 180-degree view of the ocean; no you don’t have to wake up from a dream as this can be your wedding reality! 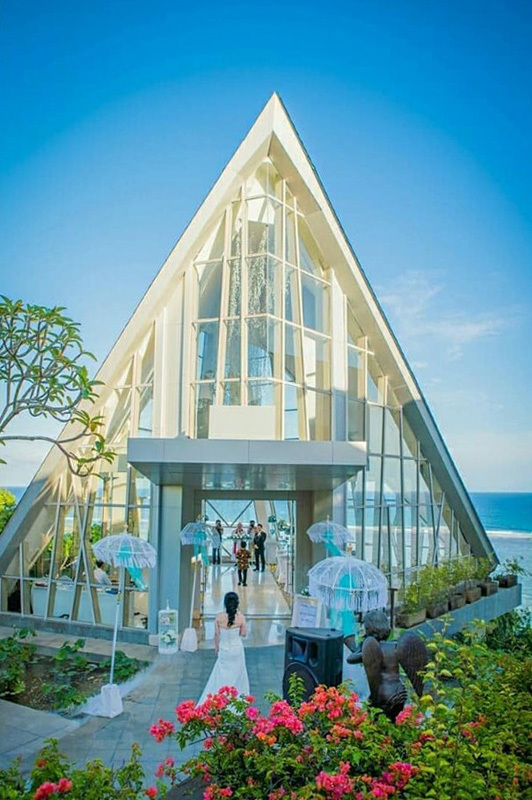 Located at Samabe Bali Suites & Villas, Pearl Chapel is a one-of-a-kind fairytale that wedding dreams are made of. As many as 60 of your friends and family members can join you in the romantic space that they’ll be talking about for the rest of their lives! 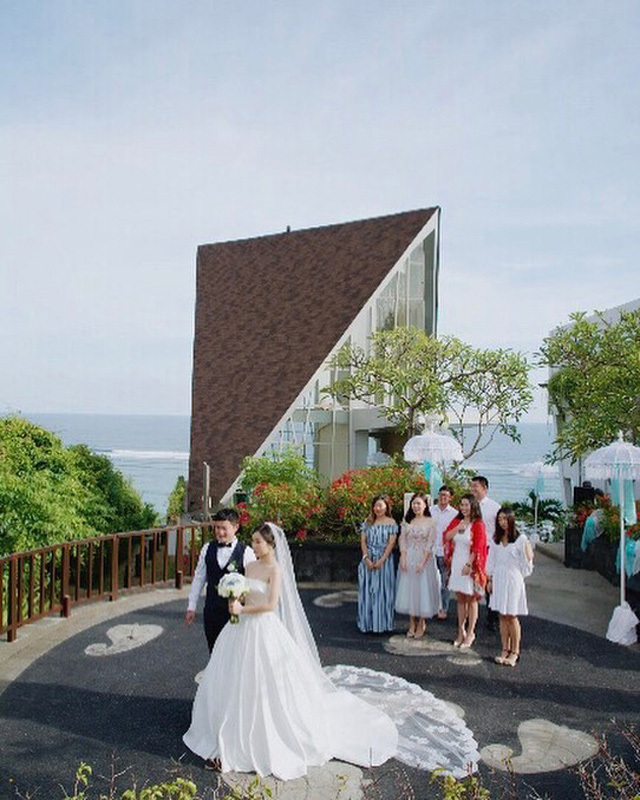 Beyond the convenience of getting married at a site that has everything — a chapel, rooms for getting ready, food and beverage services, and accommodation for all your guests — Samabe Bali Suites & Villas also fuses the art of hospitality with special event planning and delivering romance in an all-in-one package. Plus, the ocean views that count as a little complimentary bonus! If you’re more of a traditional bride, saying your vows in a chapel will be sacred for you. 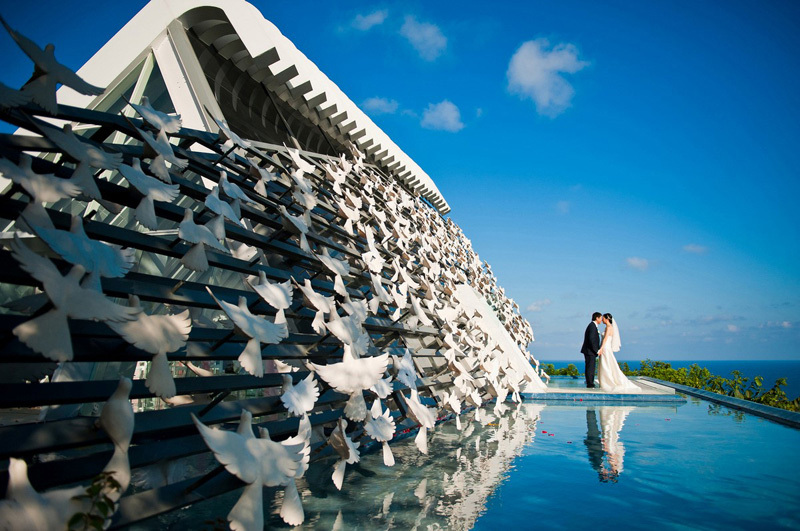 Right on a cliff edge in Bali, stylish couples can tie the knot at the Banyan Tree Resort’s very own White Dove Chapel – a stunning venue that provides magnificent views of the grand blue horizon and one where the simplest touches from your wedding theme will be enough to turn it to a ceremony your guests will remember. To give you a brief idea, guests and the bridal party arrive by way of a white walkway that seems to hover just above the surrounding pools. 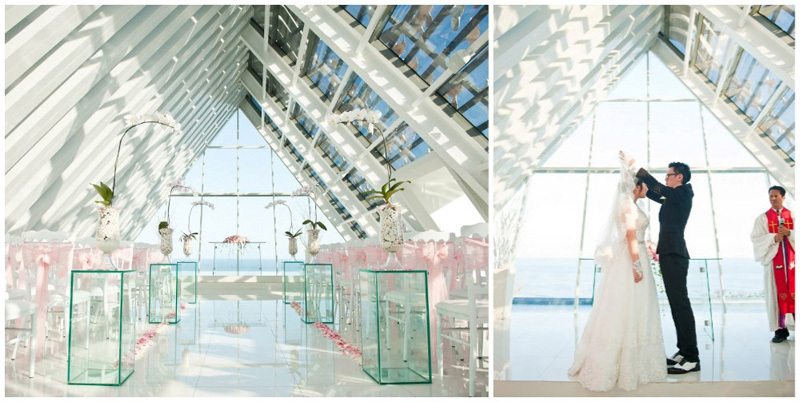 A long aisle leads to an exquisite altar where natural light pours in from the floor-to-ceiling windows. Outside, the sides of the chapel are adorned with white doves effortlessly resting and waiting to bless you with their secret love potion! 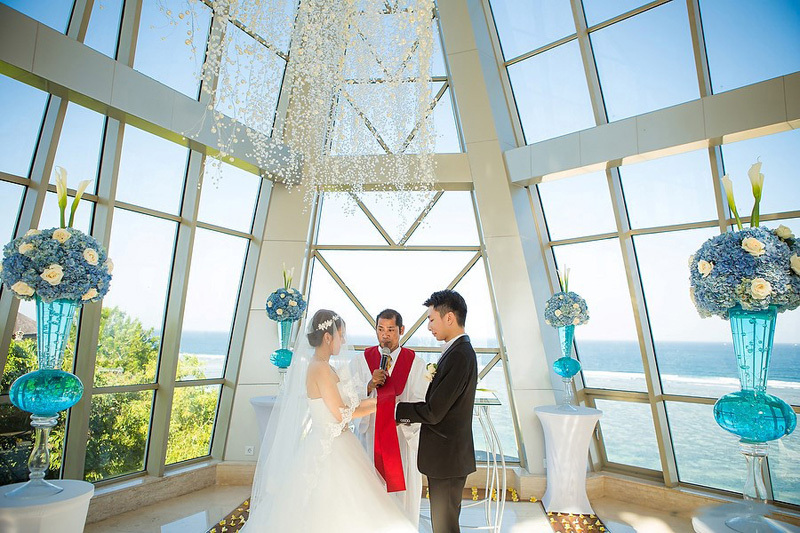 While the defining feature of the venue is its splendid location, you will be surprised at the simple wedding package that comes with a two-night stay in a ‘Pool Villa Sea View’ for the bride and groom, inclusive of daily buffet breakfast (careful, do ensure you still fit in your wedding dress!). Wondering about the secret love potion? Well, doves represent romance and love. Doves also represent monogamy and loyalty in relationships because they tend to stay with the same partner during mating season, so let them sprinkle their magic dust all over your married life! No, it has nothing to do with Prince William or Prince Harry. 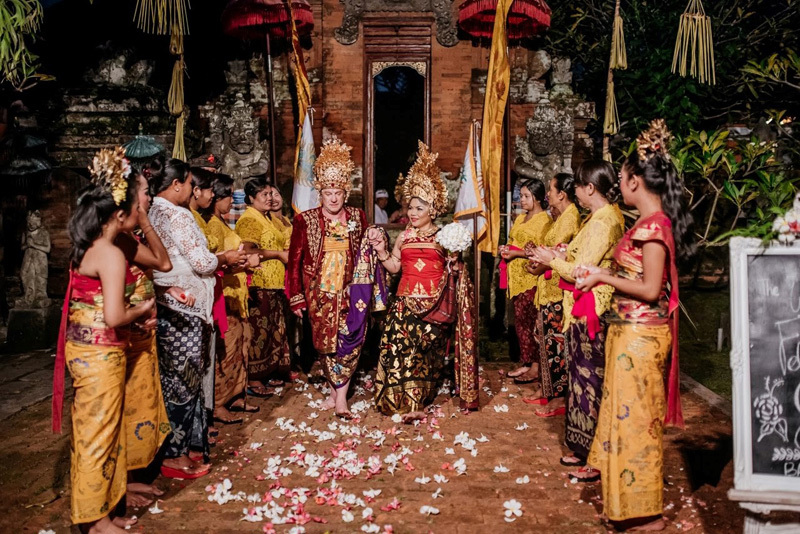 Come on, you’ve got your own prince now and a spectacular way to steal his last name is to present yourself at your wedding dressed in a traditional Balinese goddess costume (yes it is royal-approved!). 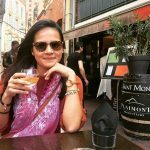 But it isn’t only because you get to dress like a goddess and get married in a mystical Hindu temple that this experience is so-called “exotic”. 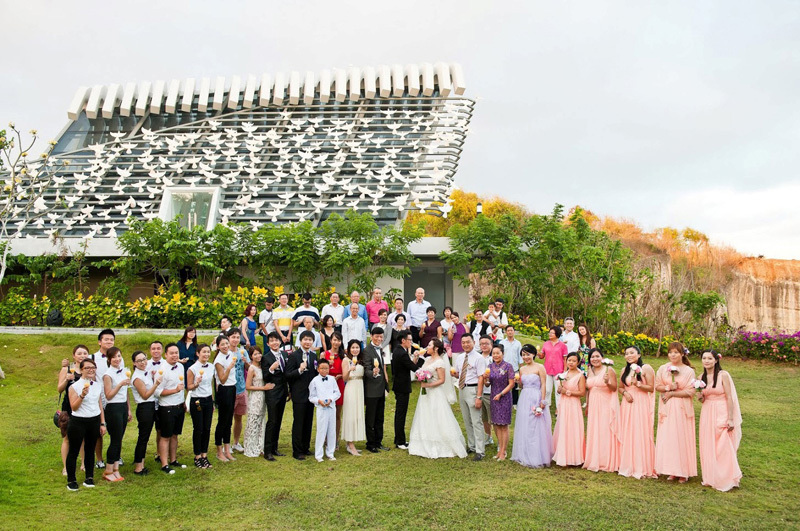 In fact, for the local brides and grooms, the wedding is more than just the union with their spouse — it is as important a life event as it is a spiritual milestone and this is a value you might well feel when local villagers will shower you with gifts and tropical flowers throughout your traditional ceremony. 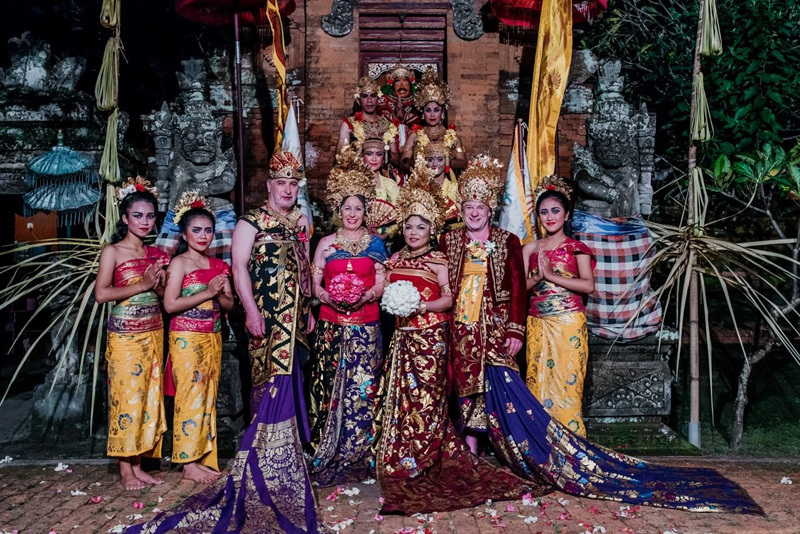 There is a saying in Balinese culture which translates to “You are not only marrying the bride, but you are marrying the family as well”, and so to truly immerse in the traditions you also benefit from special inclusions such as a traditional orchestra, Balinese performances and of course a dinner served in traditional style. In between myths and legends, there is something that binds these customs from near and far – and that is love. Ready to skip the traditional white wedding to lust for something a bit more unique? We guarantee these venues will have your guests talking for months to come! 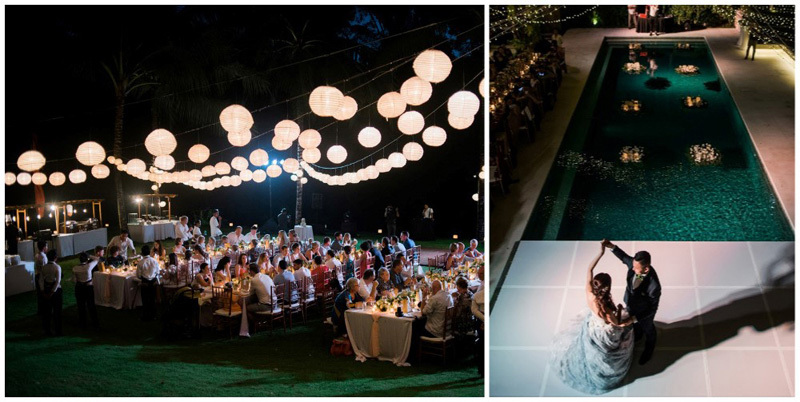 Let us know which is your dream wedding venue!